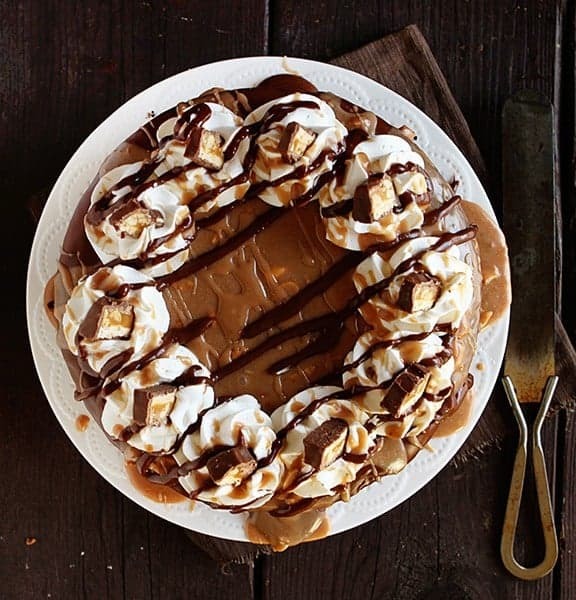 This show-stopping Snickers Cheesecake Cake is definitely meant for special occasions! 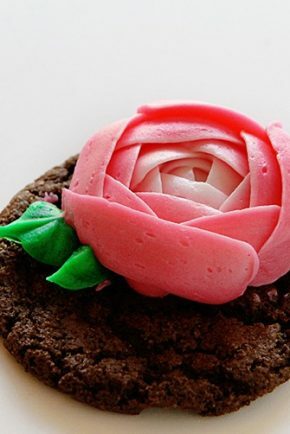 It’s so sweet you may get a tooth-ache! 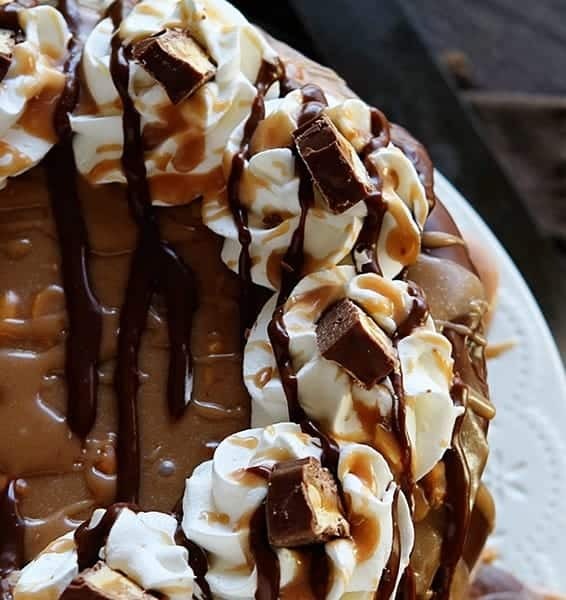 😉 If you love decadent desserts be sure to head on over and look at this! Yes, it most definitely is. But I could not help myself. It was magical, that spilling forth of sugary sweet rich chocolate ganache and Snickers® frosting. Yes, I said Snickers frosting. Poured on a cake. 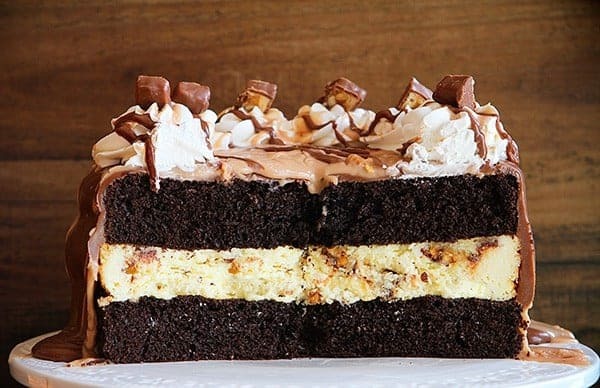 A cake with a Snickers cheesecake inside. 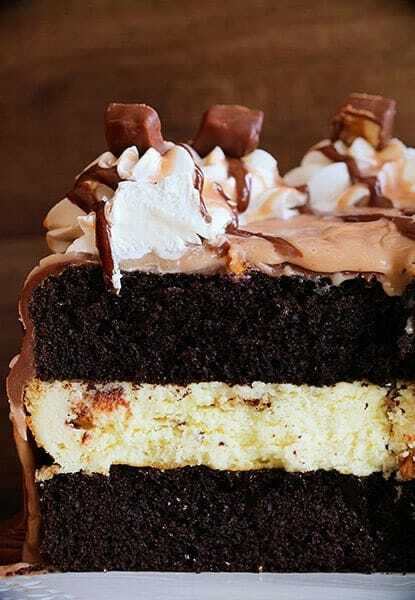 Sandwiched between layers of dark chocolate cake. 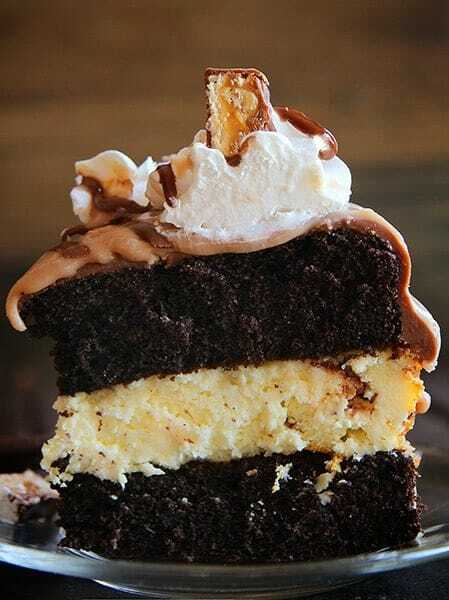 Then topped with whipped cream and more chocolate ganache and Snickers frosting. I think this cake ranks right up there with one of the most over-the-top I have ever made. And I have made a few my friends. I believe the first one I ever made was actually more than 2 years ago – White Chocolate Cheesecake Milky Way Cake-, but not nearly as pretty as anything others are making! Recipe adapted from Snickers® Bar Cheesecake Pie, Snickers® Frosting, Perfect Chocolate Cake. Prepare Snickers Cheesecake and allow to cool for a couple hours. Prepare ganache immediately after making the Snickers frosting. Place one 8-inch layer of chocolate cake on cake stand. Carefully place cheesecake on top of that. Set other layer of 8-inch cake on top of cheesecake. Pour warm ganache over cake and allow to spill over the sides. This is a THICK ganache: if that bothers you at all feel free to add milk or heavy cream, one tablespoon at a time, to reach your desired consistency. Right after you have poured the ganache, gently spoon the Snickers frosting over the cake. This is much thinner and will run over the sides faster, so go slow and get a feel for how you want the cake to look. 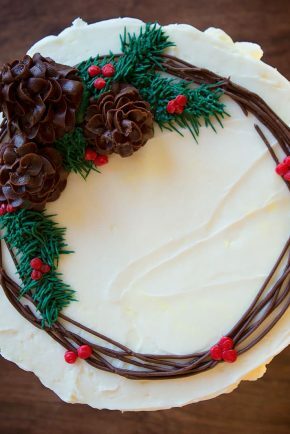 Using an open star tip, pipe out dollops of whipped cream around the edge of the cake. Using a fork (or a piping bag with a very small round tip) drizzle more ganache and frosting over the cake. Insert a piece of candy bar into the top of each whipped cream dollop. Chill until ready to serve. I am here to help folks. 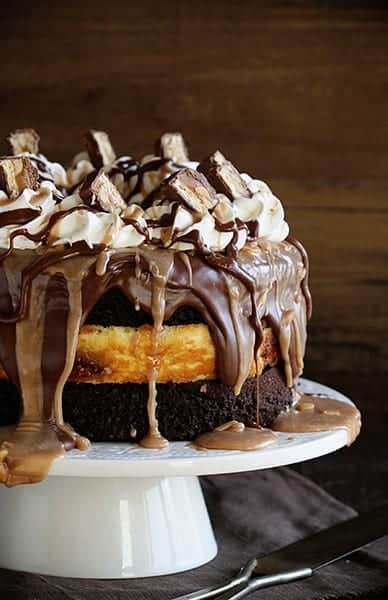 This show-stopping Snickers Cheesecake Cake is definitely meant for special occasions! 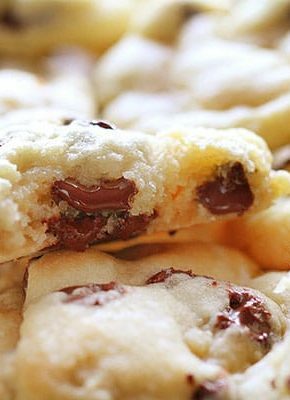 It’s so sweet you may get a tooth-ache! Place cream cheese into bowl of stand mixer. 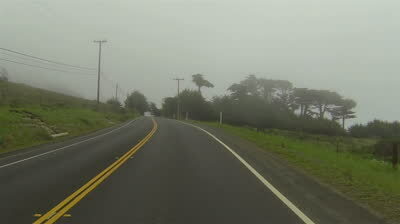 Mix on medium-low speed for 30 seconds. Add in sugar and eggs and beat until smooth. 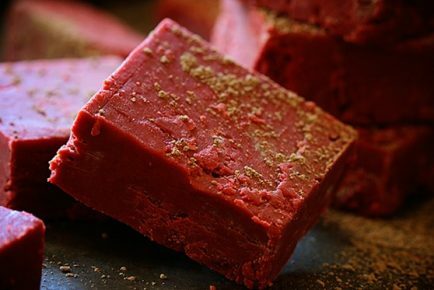 Remove bowl from stand and stir in chopped candy bars by hand. Stuff face full of chopped snickers pieces and tell no one. Ever. Prepare an 8-inch springform pan by spraying with bakers spray and lining with parchment. Pour the filling into the pan and bake until set, 35-40 minutes at 325 degrees. Set the pie on a wire rack and let it cool completely. Refrigerate for at least 2 hours before assembling cake. the bottom of the bowl with a rubber spatula. Pour the batter into the prepared pans and bake for 35 to 40 minutes at 350, until a cake tester comes out clean. Pour water to depth of 3 inches into bottom of a double boiler (or medium pan) over medium-high heat, and bring to a simmer. Reduce heat to medium; place chocolate and salt in top of double boiler (or medium pan) over simmering water. Cook, stirring constantly, 2 to 3 minutes or until melted. Add sweetened condensed milk and stir constantly for 1 to 2 minutes or until blended and smooth. Remove from heat; add butter and stir 4 to 5 minutes or until smooth. confectioners sugar (starting with 3 cups and adding more only if frosting seems to runny) then the milk. I don’t have a double boiler, how else can I melt the morsels? I enjoyed your recipes ,and would like to be place on your email list .thank you. 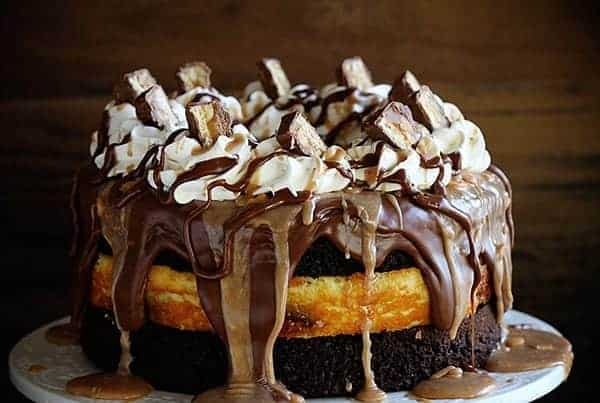 I haven’t made the Snickers cheesecake yet but plan to very soon. Would love to see anything and everything you post! I loooove all your recipes. I’m making this cake for my son’s birthday. He’ll love it. I suggest using a boxed cake mix. I made the cake from scratch and the cake was runny. I didn’t even put in all the coffee because it was not a good consistency for batter. it baked up fine but when I tried to get it out of the pans, it fell apart. Hopefully the rest will go together well. Loved the from scratch cake and the cheesecake. Baked up beautifully! I used the 8in. cake pans like it said and it boiled over. So disappointed was going to be my dessert for Thanksgiving. 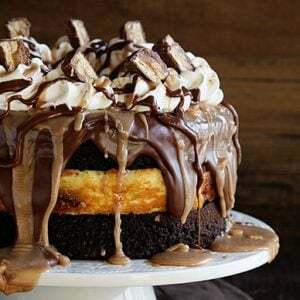 Going to try this Snickers Cheesecake..thank you for this recipe. I made this cheesecake cake last week. It was absolutely delicious. A couple of suggestions/changes. : I added about 3/4 cup more of flour as the batter just seemed too runny. The cakes came out moist and nice. As for the whip cream, I would use real whip cream and don’t type it on until the cake icing has cooled quite a bit. I wiped it on right away and the whipped cream slid down the side of the cake. Perhaps just pipe it on when you’re ready to serve. This is very rich so you certainly could serve probably 20 people with the cake and there is definitely extra icing and ganache. 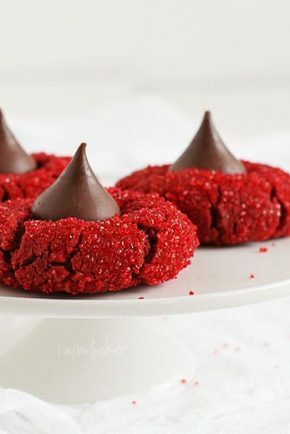 A friend of mine shared this recipe on Facebook wishing should could try it. As a surprise, I made it for her birthday. Since then, I have made this cake 4 times now. Not only does it turn out beautifully every time, but everyone thoroughly enjoys it! Thank you for creating and sharing it!